When used in motorcycling, the “Bobber” name provokes unique concepts: essentiality of line, purity of design and original sportiness. When used with the V9 name, these concepts take on deeper meaning, which are evident from the first look at the matte-black Moto Guzzi V9 Bobber. Bobbers appeared in the United States after World War II, created by passionate riders who stripped away all details that were superfluous to their goal of running fast on dirt tracks. To compete in these conditions, these riders mounted oversized tires, giving the bikes a wider footprint for traction. Next was no-nonsense styling; just like the Bobbers of lore, the V9 Bobber abandons all chrome plating and glossy finishes for matte-black details. The V9 Bobber’s side panels and fuel tank are pure black, with just a few graphic details in yellow or matte red. The exhaust, mirrors and both metal fenders are also painted in dark matte. Additionally, the fenders were shortened, contributing to the minimal look of the V9 Bobber. 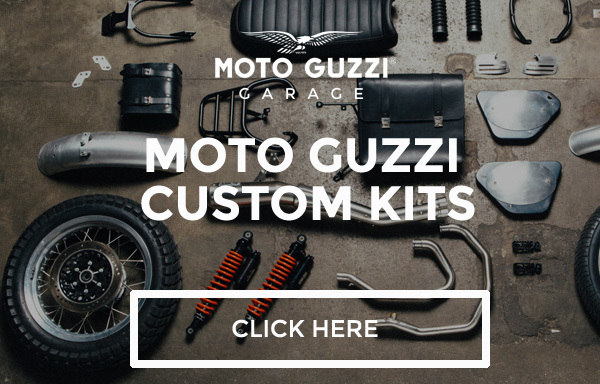 The 16” matte-black rims are decorated with a grey Moto Guzzi logo and fit larger tires (130/90 front, 150/80 rear) over the base V9 motorcycles. Even with the fatter tires and distinctive design, the V9 Bobber still provides exceptional riding pleasure and handling, regardless of its sportier riding position and low drag handlebar. The V9 Bobber is a true Moto Guzzi, and does not trade rideability for beauty. The ground clearance of the Bobber is only 30.3 inches, and if you add to this the exceptionally low curb weight of 438.7 lbs., you can easily imagine the level of comfort, control and rider pleasure offered by the V9 Bobber. The V9 Bobber arrives with a 90° transverse air- and oil-cooled 850cc v-twin engine that is tweaked for the all-around performance. The V9 Bobber’s engine produces 55 horsepower @ 6250 rpm, and 45.7 ft/lbs of torque @ 3000 rpm. The engine utilizes a single dry-plate clutch and six-speed transmission that delivers the power to a double-jointed drive shaft offset by a new bevel gear, which provides solid and reliable management of the powerful torque supplied by the twin engine. Following in the footsteps of the V7II and the big 1400s, the V9 Bobber is the latest bike from Moto Guzzi that continues the tradition of safety and riding pleasure. The V9 Bobber’s braking system utilizes nothing but the best: Brembo four-piston calipers squeezing a 320mm steel disc up front, and a two-piston caliper squeezing a 260mm caliper out back. Like all modern Moto Guzzis, the V9 Bobber is equipped with advanced electronic systems for additional safety. The Bobber arrives with a standard advanced two-channel ABS and MGCT (Moto Guzzi Traction Control) that’s adjustable in two levels of operation and can be turned off. Other standard features include an immobilizer and USB charging port located under the steering head. The extensive catalog of accessories for the V9 Bobber includes the MG-MP, the Moto Guzzi multimedia platform that connects a smartphone to the vehicle to provide an exceptional quantity of information useful for the journey. An optional multimedia platform, the MG-MP, allows you to connect the V9 Bobber to your iOS or Android smartphone. The app is available for free download from the App Store and Google Play, making your smartphone an on-board multifunctional computer and the link between the motorcycle and the Internet. You can record trip data and review them on your computer or directly on your smartphone, analyzing the distance covered together with the V9 Bobber’s operating parameters. The system also allows you to easily locate your vehicle when you park in a strange place, automatically saving the position where it was switched off. The new V9 Bobber a can be widely customized from the vast range of genuine Moto Guzzi accessories. These OEM parts undergo strict testing cycles, like any other original motorcycle component, in order to ensure quality and reliability. Moto Guzzi has designed an authority-approved sportier exhaust system for the V9 Bobber with the total black look and deep sound. There are many details in aluminum billet that add more charm and exclusivity, and there are also practical accessories, such as the urban style fairing and luggage sets, which blend very well with the design of the V9 Bobber.